NASA's Dawn spacecraft obtained this image of the giant asteroid Vesta with its framing camera on July 24, 2011. It was taken from a distance of about 3,200 miles (5,200 kilometers). Dawn entered orbit around Vesta on July 15, and will spend a year orbiting the body. After that, the next stop on its itinerary will be an encounter with the dwarf planet Ceres. This story was updated at 1:58 p.m. EDT. A NASA spacecraft orbiting the huge asteroid Vesta is beaming home images that reveal the giant space rock like never before, showing its battered and pockmarked surface in stunning detail. 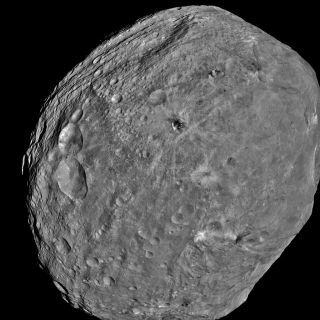 The new Vesta photos from the Dawn probe, which NASA unveiled today (Aug. 1), include the spacecraft's first full-frame view of the entire asteroid and should help astronomers understand how the space rock formed in the early solar system, researchers said. The detailed images of Vesta's surface were taken from a distance of about 3,200 miles (5,200 kilometers), using Dawn's framing camera. The pictures were snapped for navigation purposes as the spacecraft prepares to begin its scientific observations. "As the mission progresses, we'll be taking data at higher and higher resolution that will enable us to understand surface processes and interior processes better," Russell said. The $466 million Dawn spacecraft entered orbit around Vesta on July 15, beginning a yearlong mission to orbit and study the asteroid. Vesta, the brightest asteroid in our solar system, is the second-largest object in the main asteroid belt between Mars and Jupiter. The space rock measures about 330 miles (530 kilometers) across. Dawn took this image over Vesta's northern hemisphere after the spacecraft completed its first passage over the dark side of the giant asteroid on July 23, 2011. Dawn will map Vesta at three different, and increasingly lower, orbits. During this process, the spacecraft will collect information on the elemental composition of Vesta's surface and its mass distribution, in addition to gathering gravity data and radio telemetry. These measurements will help astronomers understand Vesta's formation history, which should also shine a light on the building blocks of the early solar system, researchers said. Early photos of Vesta zeroed in on intriguing features on the rock's surface, including the boundary between the day and night sides, but these new images reveal a much closer look at the surface features at the asteroid's two poles. "The south pole area looks smoother, certainly different and less cratered than the northern hemisphere," said Holger Sierks, a member of Dawn's framing camera team at the Max Planck Society in Germany. Vesta's heavily cratered northern hemisphere exhibits visible dark and light patches, something that members of the science team are eager to see in closer detail. "We don't know what the dark spots mean to us, but we will find out when we get the higher resolution images from lower orbit," Sierks said. The images also revealed elongated and deep grooves with the many craters in the northern hemisphere, an unexpected find that surprised the science team. "Those grooves are really neat," Russell said. "We saw those really early and they puzzled us and pleased us at the same time. You see those craters, with the black and white debris streaming down in them. Why such a great color contrast or albedo contrast on that material? It's not something I'm familiar with. We're going to learn a lot about this body." The science team is keen to investigate features on the crater's rim in order to glean information about the violent event. Furthermore, the grooves detected in the northern hemisphere could be markers of how intense the force was from the ancient collision, Russell said. "[We're] really anxious to look at the north pole to see how that energy focused through the body, and what it did to the north," he added. Dawn's close observations of Vesta will help astronomers understand the early days of the solar system, the asteroid belt, as well as the processes that formed and shaped rocky planets like Earth, Russell said. "Now that we are in orbit around one of the last unexplored worlds in the inner solar system, we can see that it's a unique and fascinating place," said Marc Rayman, Dawn's chief engineer and mission manager at NASA's Jet Propulsion Laboratory in Pasadena, Calif., in a statement. NASA's Dawn mission is the first prolonged visit to a large asteroid. The spacecraft is expected to take detailed photos of Vesta, closely studying the giant rock from three different orbits. "We have been calling Vesta the smallest terrestrial planet," Russell said in a statement. "The latest imagery provides much justification for our expectations. They show that a variety of processes were once at work on the surface of Vesta and provide extensive evidence for Vesta's planetary aspirations." Due to Vesta's large size, many astronomers classify it as a protoplanet, saying it would have continued to develop into a rocky planet like Earth or Mars if Jupiter's gravity had not wreaked havoc in the asteroid belt long ago. While Dawn has been gathering some science data, the mission's intensive collection of information is expected to begin this month. After spending a year at Vesta, Dawn will leave its orbit to travel to the asteroid Ceres, which is the largest body in the main asteroid belt. Ceres measures about 590 miles (950 km) across and is so large that it is considered to be a dwarf planet. Dawn is expected to arrive at Ceres in February 2015. NASA's Dawn mission is expected to return close-up views of Ceres, which should allow scientists to compare it to Vesta. Unlike the drier and more evolved Vesta, Ceres is considered to be more primitive and wet, possibly harboring water ice, researchers said. The Dawn spacecraft launched in September 2007 and has since traveled more than 1.7 billion miles (2.7 billion km).